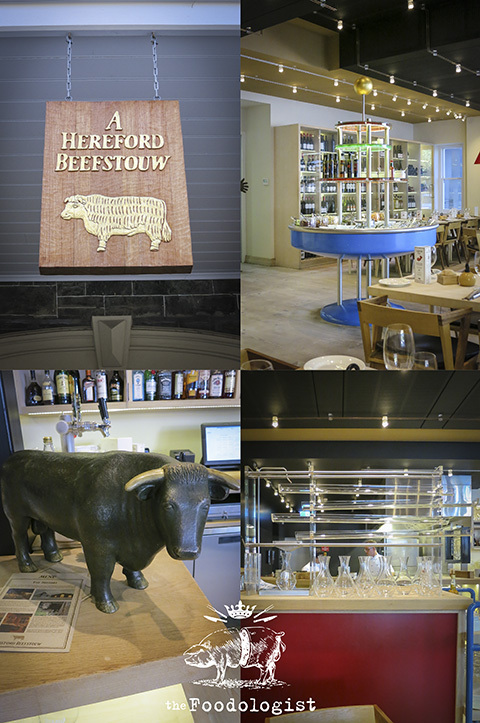 A few weeks back saw us visiting Hereford Beefstouw, Adelaide during some very hot weather. Travelling with our friends with kids in tow, we were welcomed early into this Hutt Street ‘meaty-eaterie’. 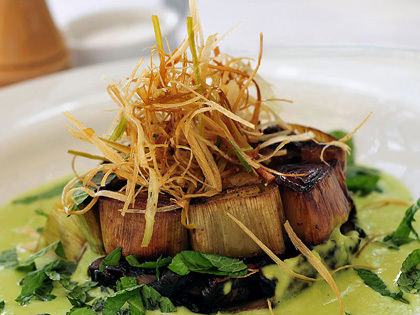 Having opened in September, 2011, this place has established itself amongst Adelaide’s best steak houses with a number of different cuts of beef on offer. The place is well appointed with what I would categorise as a ‘scandinavian feel’ which one assumes it inherits from its original ‘sister’ establishments in Denmark. This opening came about as a result of one of the owners who was selling beef to the scandinavian restaurants who wanted to give a similar offering to what was being done in Europe. The result is in someways typically scandinavian, a little bit quirky, with a focus on simple yet high quality product on offer. In keeping with the ‘quirky’ theme, ordering here was kind of fun. 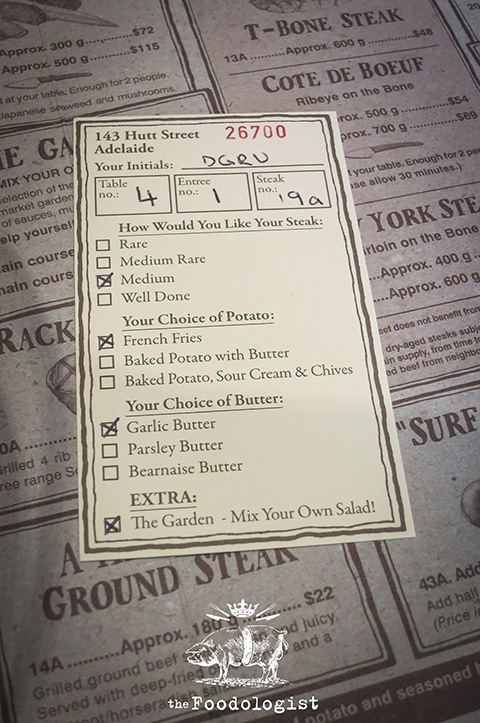 The menu items are listed with numbers and you merely list the number in each appropriate box for each course. You are then able to specify how you want your meat cooked, what flavoured butter you want and whether you want to use the famous salad bar. I must admit to always thinking about places I visit from an operational perspective and I would have to say that I’m not sure whether this makes any difference for the efficiency of the restaurant. It would presumably be better if this was electronic so that invoicing would not have to entered manually again by staff…I digress. This small picture, does not do justice to the salad on offer. ‘The Garden’ is the salad buffet that Sizzler was never able to be. Everything on offer here is firstly fresh and clean with none of the ‘scrunchy’ mouth scratching that comes with poorly looked after salad greens. Along with a good degree of base ingredients are just about every salad dressing one could want and numerous garnishes meaning that the quality of the salad you end up eating is merely limited by your own ability to choose wisely. 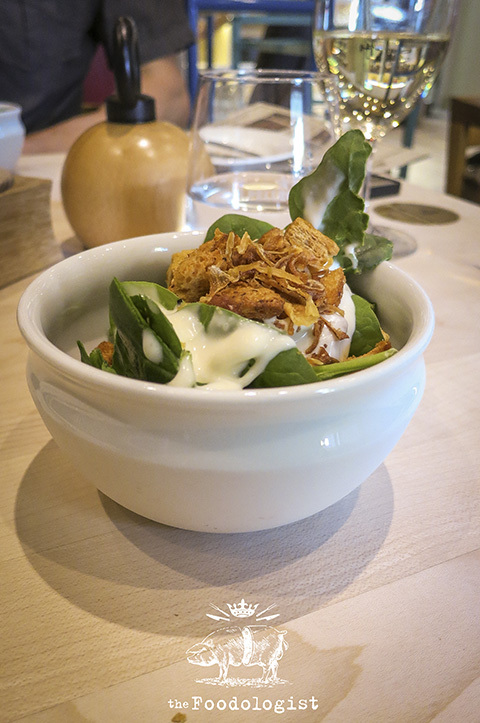 I opted for some simple greens, croutons, fried shallots and blue cheese dressing. 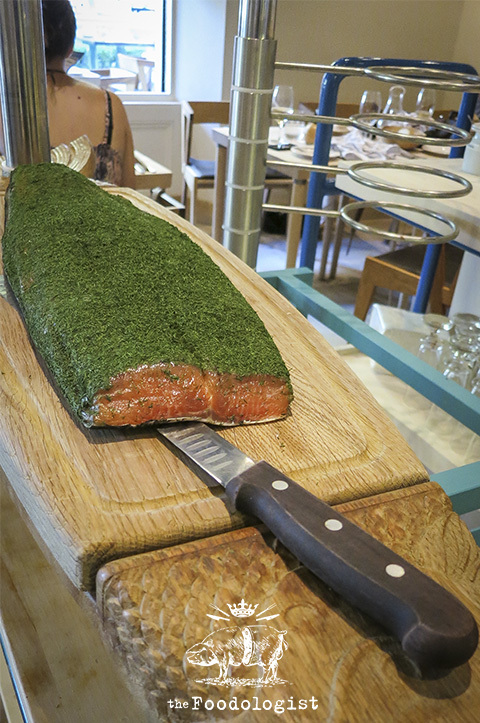 The Gravadlax comes traditionally served with some Rye bread and butter and a Mustard dressing. 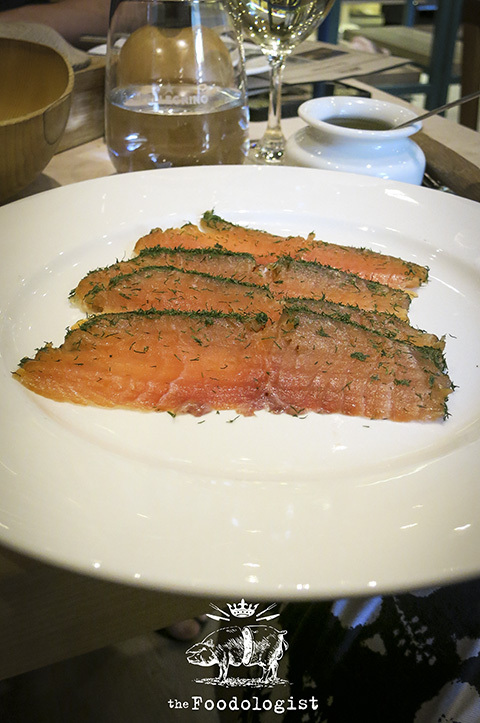 I initially thought the amount of dill on the fish might be somewhat overpowering but it wasn’t. The salmon had been cured well and was a good start to the meal. This was a beast of a cut of meat. 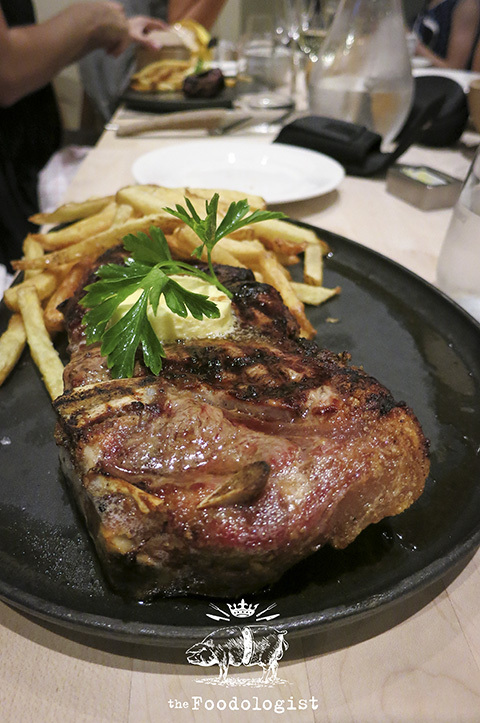 400g of Sirloin (Porterhouse) on the bone. What I love about this cut is that whilst the meat is generally lean, you get a strip of fat along the side which if cooked well, adds a bit of juice to the meat and allows you to choose how much fat you want. I generally tend to go the ‘whole hog’ and in this case it was no exception. The addition of the bone whilst not necessary was a nice touch. The meat was of good quality with acceptable levels of tenderness and a good degree of flavour (another advantage compared to the somewhat overrated fillet). Served with chips, it was simple but wholesome and exactly what I was after. I like seeing simple and somewhat ‘traditional’ desserts that are given a slight twist that works and this was one of them. 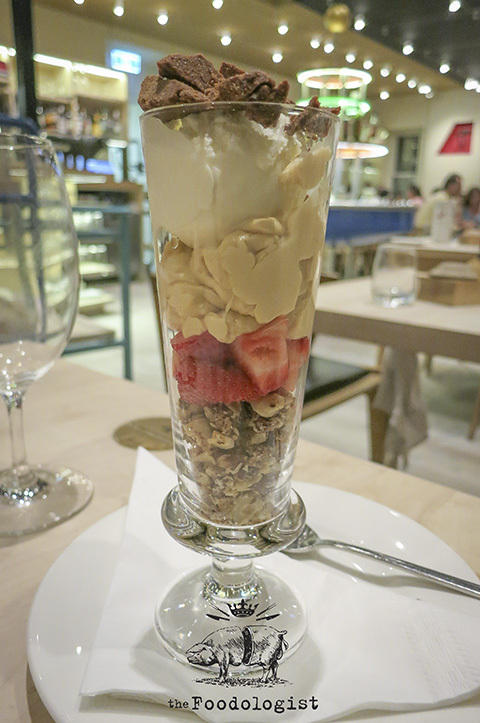 Hazelnuts, Strawberries, Crumbed Caramel, Vanilla Ice-Cream and Dulce de Leche, layered in a glass. Simple and delicious and given how hot it was, this was possibly my favourite part of the meal. Overall, Hereford Beefstouw is not breaking new gastronomic territory. BUT, if you want a great steak in a nice venue that is both a bit savvy but also family friendly, I would suggest you visit this place. As usual for this part of town, the wine list is good with a nice selection of local and imported wines. Good beers and good times. One could argue that it is a little pricey compared to your average steak at your local pub but as always, you get what you pay for.